On January 20, 1944, 24-year-old Pilot Officer Herbert Krentz of Winnipeg was a little behind schedule when he brought Halifax Mk V The Raven’s Revenge into the air. Ground crew had been slow to bomb up the relatively new plane with its 6.5-ton payload. Adding to Krentz’s anxiety about his first mission in the “Revenge” was the small matter of two fully loaded 30-ton bombers that had collided on the runway ahead of him. With just one-minute left to zero-hour – the point at which Krentz and crew could officially scrap the mission – the four Rolls-Royce Merlin engines roared to life and the boys were on their second bombing run to Germany in less than 24 hours. This time the target was the industrial city of Magdeburg. 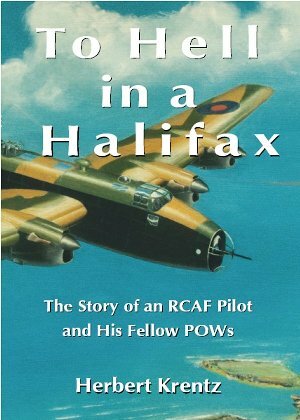 The night before, Krentz had nursed a heavily damaged Halifax back from Berlin, “the Big City,” where the starboard wing was violently punctured when a “friendly” Lancaster or Halifax disgorged its bomb load on top of them. Four incendiaries took out the strut and bracings, which were the width of a man’s arm, and one of the projectiles even hit a fuel tank, but by some miracle only dented it. During the return trip the gunners spotted two Junkers 88s on the prowl between Berlin and the Dutch coast. Wisely Krentz instructed them to hold fire. Their .303 Browning machine-guns were no match for the four 20-mm cannon on the deadly Luftwaffe night-fighters. As if this weren’t enough hair-raising danger for one night, just after Krentz engaged George, the automatic pilot, to buy himself a little rest during the home run, a Nazi ship pummeled them with flak, adding 100 holes of misery to the bird’s underbelly and wings, rendering one of the rudders nearly useless, and punching a sizable hole beneath the navigator’s seat. Limping towards the British coastline, fuel streaming into the North Sea, the mangled Halifax dropped to 6,000 feet, well under the Air Ministry’s required ceiling of 10,000 feet. Frantically firing flares and signalling the letter of the day with the Aldis lamp, the crew was barely able to save themselves from their own zealous anti-aircraft brigades. With 100 miles to go to home base, a straw poll decided it – Krentz and crew would try to make Croft, Yorkshire, and their own beds that night. They made it, though after inspecting the plane in the morning, Krentz couldn’t understand how they had stayed airborne. On the Magdeburg raid the next night (January 21/22), theirs was one of approximately 60 Allied bombers that didn’t return. Coned by searchlights near Bremerhaven in northern Germany, and bombarded by flak, Krentz’s defensive maneuvers bought them a little time, but the fully loaded plane exploded, sending him somersaulting through the air still holding the wheel. It was only his second flight wearing a seat-pack parachute, something he had hounded his superiors for daily. While floating back to earth he saw only one other parachute, but later learned that rear gunner Sgt. John Di Pinto of Toronto was mortally wounded on the ground, cause of death unknown. Krentz landed, injured and burned, in a water-filled ditch and was dragged along the ground by high winds. He managed to evade German soldiers who passed within 50 yards, and he later hobbled into a barn for shelter after witnessing the destruction of another Halifax on the egress leg of the Magdeburg raid. The next afternoon the German farmer discovered the ailing fugitive, and took him to his farmhouse. There he offered Krentz coffee and food; looking in a mirror before washing up, Krentz didn’t recognize himself. He was black all over and half his face was burnt. Suddenly the door opened and Krentz saw another traumatic sight in the mirror: two menacing soldiers were pointing their guns at him. As the son of German-Canadian immigrants, Krentz spoke sternly to them in their own language, telling them that the Geneva Convention guaranteed prompt medical attention for prisoners. Then he demanded to see the mayor, the Bürgermeister. This may have saved his life, as vigilante killings of Allied airmen were not that uncommon at the time in Germany. The mayor took Krentz to the nearest military outpost, although again he was verbally and physically threatened by soldiers. Again he quoted the Geneva Convention and demanded to see the officer in charge – a man around his own age who drove Krentz to a hospital in Oldenburg. There his burns and wounds were tended to with the same care provided to injured Germans. A week or so later, however, after the typical physical and psychological abuse at the hands of the Luftwaffe interrogators at Dulag Luft in Frankfurt, he began his 14-month incarceration in Stalag IV B, located near Mühlberg on the Elbe, in central Germany. While Krentz’s German accelerated treatment for his injuries and may even have saved his life, ironically it made some of his fellow prisoners suspicious that he was a German spy. Since he was the sole survivor of his plane, initially no one could personally vouch for him as a bona fide Allied airman. Two important skills, however, soon won him the favour of his fellow POWs. First, his German was instrumental in improving some conditions for the men through his work as an interpreter and go-between with the guards and as a translator of official German war “news”; second, he engineered a very efficient “blower,” a homemade fan-powered heater that burned scraps of wood, coal and paper, and was used to boil water and to cook meals, including Christmas dinner 1944. Sadly, Herbert Krentz passed away on July 5, 2006, in Winnipeg, Manitoba. home | the story | fellow POWs | photos | ordering info | contact | © 2006–2016 Kent Publishing. All rights reserved.